Downtown hotel on State Street in Santa Barbara near beaches & walking distance to Stearns Wharf, shopping, restaurants and night life. Most of our days in Santa Barbara are punctuated with sunshine and blue skies. But, rain happens. Not a lot, sometimes not enough, but it happens. 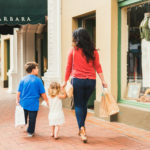 Luckily for you Santa Barbara has a number of great rainy day activities that will get you out and exploring Santa Barbara and, simultaneously, staying relatively dry. 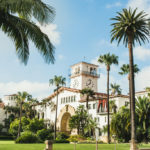 So grab your umbrella and get ready to explore from dawn to dusk, we’ve got your list of what to do in Santa Barbara on a rainy day. A rainy morning calls for all things comfortable and cozy. 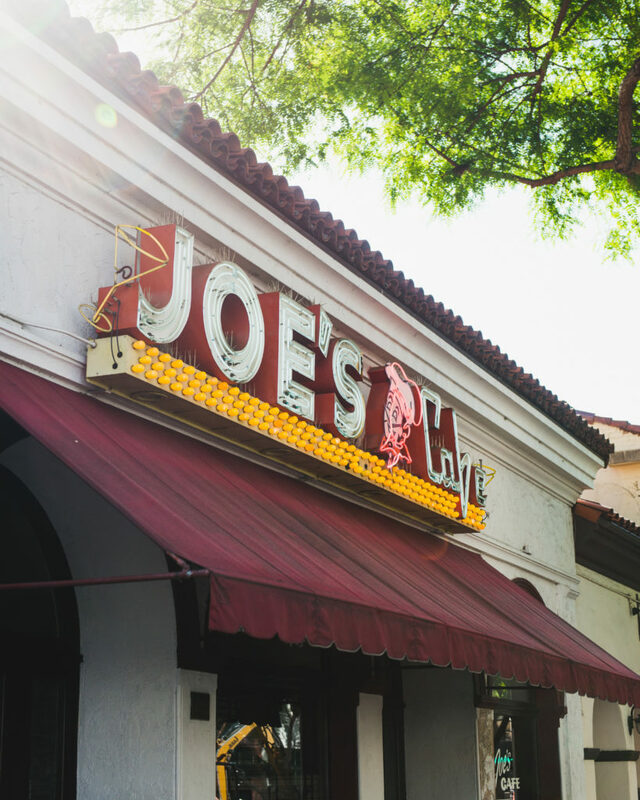 Waking up at Hotel Santa Barbara means you can grab a light breakfast in our lobby, or do what the locals do, grab a classic hot breakfast at Joe’s Café across the street. The close proximity means you barely need an umbrella to cross on over and warm up with a cup of coffee and some eggs. After breakfast, explore some of Santa Barbara’s stimulating museums. The newly opened MOXI (Museum of Exploration and Innovation) is a short walk from the hotel. The museum is devoted to science, technology and the arts, with a multitude of great interactive exhibits, making it perfect for visitors of all ages. Or try the Santa Barbara Museum of Art, a few blocks up State Street. Our small city boasts a well-curated art museum with a large collection of permanent works, as well as many special collections. Check their website for current exhibitions, events, interactive activities and more. The Carriage and Western Art Museum. Santa Barbara Trust for Historic Preservation has a list of sites to visit, including El Presidio State Historic Park. The Santa Barbara Museum of Natural History and it’s separate Sea Center located on Stearns Wharf. For lunch, try the Santa Barbara Public Market for a taste of everything. It’s the type of place where the entire family can find something to enjoy. Vendors include Corazon Cocina tacos, Empty Bowl noodles, Ca’Dario Pizzeria Veloce, ilFustino olive oil and vinegar, Wine + Beer, Enjoy Cupcakes, Rori’s Ice Cream and more! It’s Santa Barbara’s first indoor market of its kind and a fun place to explore. Free parking is available beneath the market. Nothing beats a warm fireplace and some pampering on a cold, wet day. That’s where FLOAT Luxury Spa comes in. The downtown location is a little oasis in the hustle and bustle, with plush robes, a warm fire and luxury spa treatments. Try one of their special packages for a truly unique experience. Embrace the weather and enjoy some great local color and flavor by experiencing a wine tasting. Downtown Santa Barbara hosts dozens of tasting rooms, many within easy walking distance of the Hotel. One favorite place to try local wines is the Presidio Neighborhood. This vibrant few blocks houses more than 8 tasting rooms on a historical site. Duck into Grassini Family Vineyards for the chocolate and wine pairing in their cozy tasting room complete with fireplace. 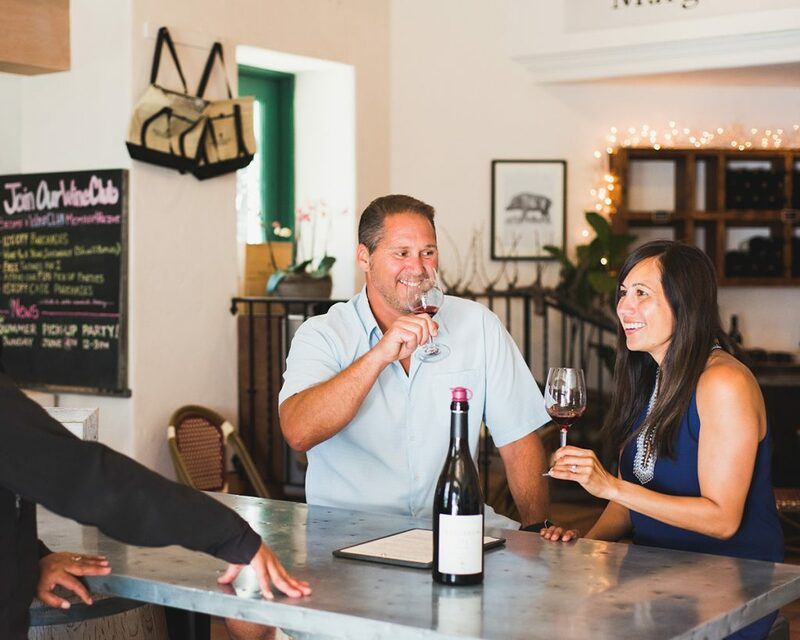 Or visit Margerum Wine Company where you’ll find that, as they say, “wine is good living” with their locally loved rosé. Dining out is a fantastic way to explore a city’s culture, flavor, climate and people. Santa Barbara has some top-notch restaurants to choose from with the freshest farm to table fare thanks to our year-round growing climate. Some of our favorite places for a dinner out include Holdren’s Steaks and Seafood across from the Hotel, Bouchon for some California-French cuisine and awesome local wines, and Opal Restaurant and Bar for some globally influenced dishes in a vibrant setting. 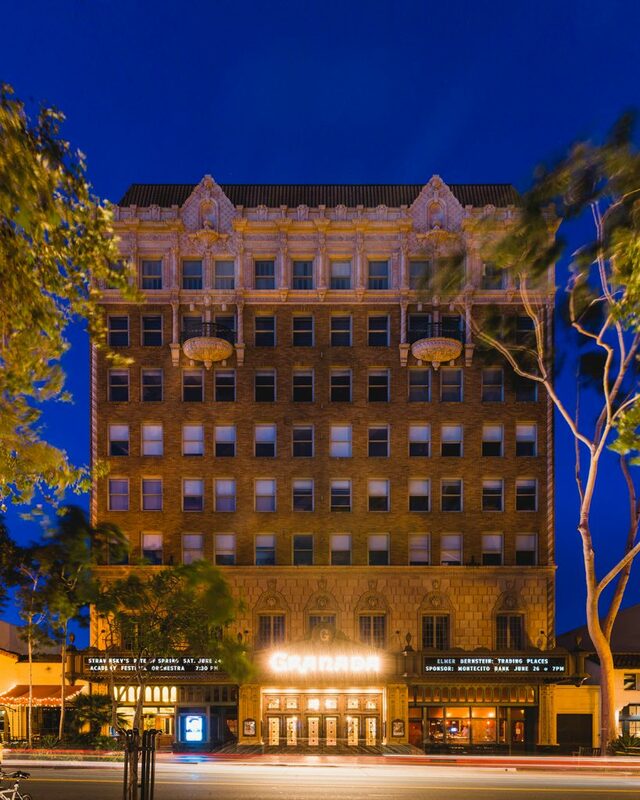 After dinner why not grab a show or a movie at one of the MANY Downtown Santa Barbara theaters and venues? The Arlington Theater, a historic theater on State Street, showcases films, speakers, comedy and big-name bands. Built in the mission revival style and beautifully restored, seats over 2,000. Its atmospheric interior contains faux-Spanish villas and a ceiling filled with twinkling stars. 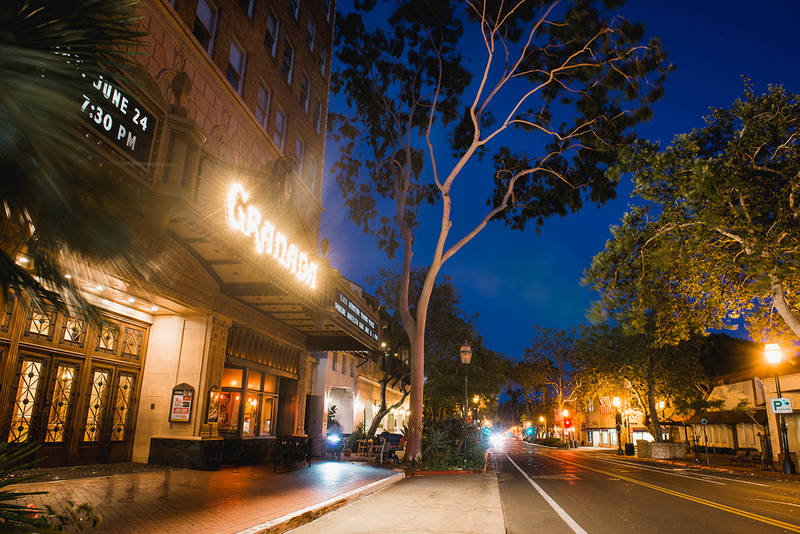 Or check out the Granada Theatre, a beautifully restored historic theater featuring live music and theater. Despite a rainy day forecast there is plenty to see, do, taste, explore and still stay dry during your Santa Barbara vacation. If you would like us to help with reservations, ticketing, or answer questions about any of these rainy day adventures just ask our concierge staff. An insider’s guide to exploring Santa Barbara. 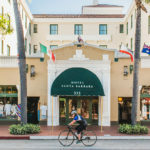 Hotel Santa Barbara is a boutique hotel waiting for you in the heart of downtown Santa Barbara where warm hospitality meets rich history. Welcome. We’re glad you found us.